During this unique tour on board the ship “Bordeaux” you will explore one of the most beautiful, famous and beloved parts of France. The region of Bordeaux, located in Aquitaine, the sun drenched, south-western part of France, is the perfect setting for a boat and bike tour. Set at the confluence of the Garonne and Dordogne rivers and the Gironde estuary, it is one of the most prolific and famous wine growing regions in the world. Caressed by Atlantic breezes, the vineyards that cover the rolling hills of the region have for centuries produced France’s most remarkable wines. Appellations such as Saint-Émilion, Pomerol, Sauternes, Médoc, Entre-Deux-Mers and Margaux have made Bordeaux wines world famous. Individual arrival and optional bus transfer from the meeting point at Gare St. Jean train station in Bordeaux to the mooring location of the boat near the Canal des Deux Mers at Castets-en-Dorthe, located in the middle of the Garonne Valley. Embarkation starts at 2 pm. You can enjoy an optional short first test bicycle ride around charming Castets, exploring this flat and fertile region aptly named “Little Holland” with its walnut trees, kiwi orchards and vegetable fields. Following the bicycle path along the Canal des Deux Mers (Canal of Two Seas) that links the Atlantic to the Mediterranean, you will discover this lush rural countryside. In the evening, a welcome cocktail awaits you on board. After a restful night on board, the first town you will discover by bicycle is the lovely Saint Macaire and its wonderful gate and walls. There is opportunity to visit the former residence of the writer Francois Mauriac as well as having your first wine tasting at a château. Riding along corn and sunflower fields you reach La Réole, using an Eiffel style bridge over the river Garonne. This town is famous because in 1190 Richard Lionheart, on his way to the holy Land, gave the town hall building to thank the locals for their loyalty to the English crown. This historical place holds two castles, an impressive church as well as narrow cobblestoned streets. To end the day you will enjoy the cycling path along the « canal de la Garonne » and its deep blue water, built in Napoleon times. You can either go directly back to the ship or ride to Meilhan-sur-Garonne and the amazing scenery it has to offer. In the late afternoon, back on board again, the tour continues by ship, heading downstream along the Garonne River to reach Cadillac or nearby Loupiac. 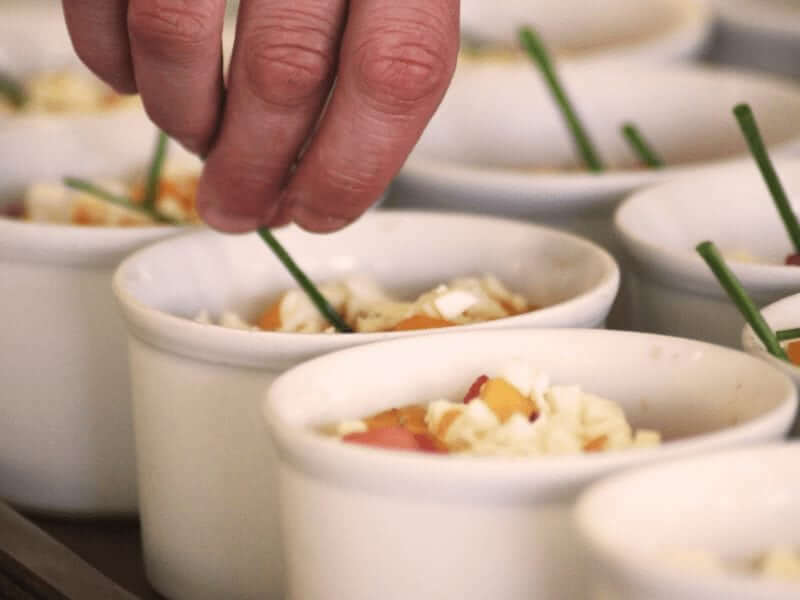 Today we will discover the Sauternes region, where sweet dessert wines are made. We start by enjoying the view from Sainte-Croix du Mont before having a look at the grave of painter Henri de Toulouse-Lautrec. The route then follows the winding banks of the small Ciron river; the colder waters (from the Pyrenees) flow into the warmer waters of the Garonne. In autumn, when the weather is warm and dry, the combination of the two different temperatures produce the mist that descends on the vineyards, promoting the perfect conditions for the famous Sauternes wine. You will pass the famous vineyards of Château d’Yquem, Château Guiraud, Clos Haut Peyraguey, and many more. Wine tastings are offered here! Cadillac is located in the region of Graves, also known as the birthplace of Bordeaux wines. It is a fortified medieval village, known as the Bastide in the Entre-Deux-Mers wine region, in between the Garonne and Dordogne rivers. 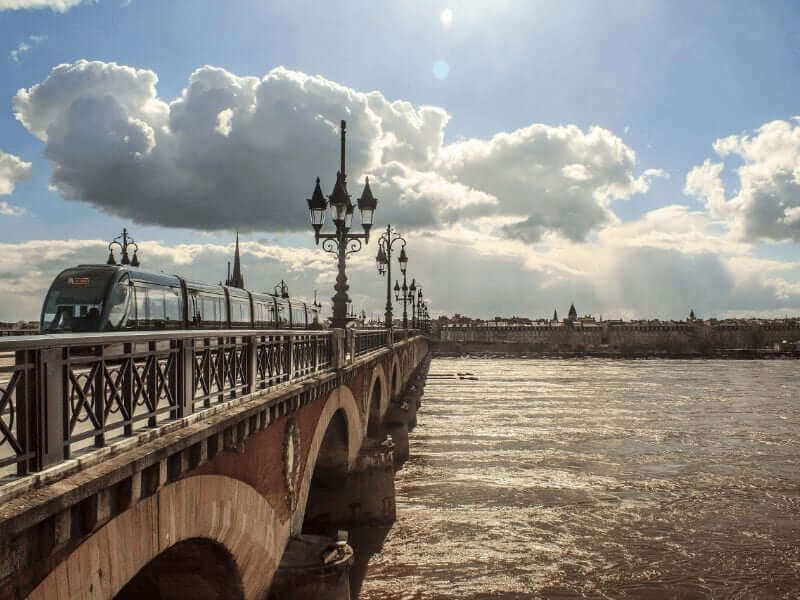 Once back on board, you will travel along the Garonne River towards the enchanting city of Bordeaux, reaching the passage of the Stone Bridge and the pier in the city center, facing the region’s most prestigious panorama: the Stone Bridge, Place de la Bourse and Quai des Chartrons. 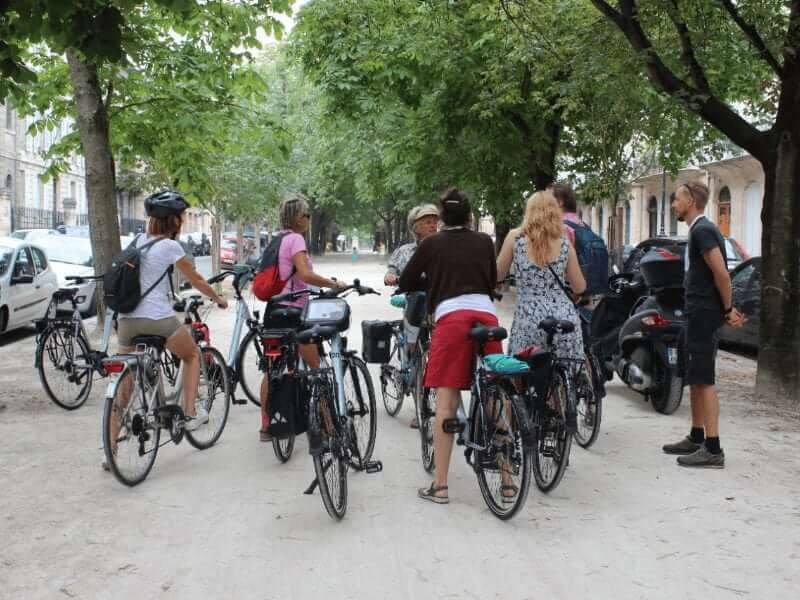 The tour leader will propose a city tour of Bordeaux to discover its architectural gems on two wheels: this short cycling tour, mainly over cycling lanes, along both sides of the Garonne river in the cycling capital of France offers beautiful panorama views of the waterfront and the city. In the afternoon, enjoy the UNESCO sites of Bordeaux during a walking or cycling tour. Its main attractions are the royal entrance of the city (Cailhau Gate), the Big Bell of Pey Berlan, the Golden Triangle, the Girondins column, the water mirror… and much more. 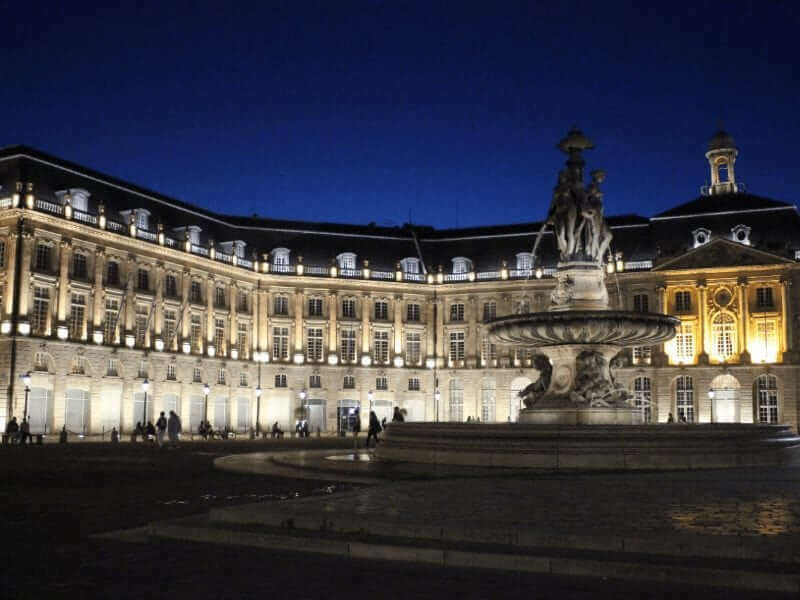 You will discover beautiful squares, a hidden garden or quaint location where you can do a tasting of the Bordeaux renowned “cannelés” and coffee or fresh oysters and white wine. There is free time in the afternoon to shop or explore. Be sure to explore the town’s streets and shops where wine is as old as the underground cellars carved in stone or to visit the newly opened astonishing “temple of wine culture”: La Cité du Vin. 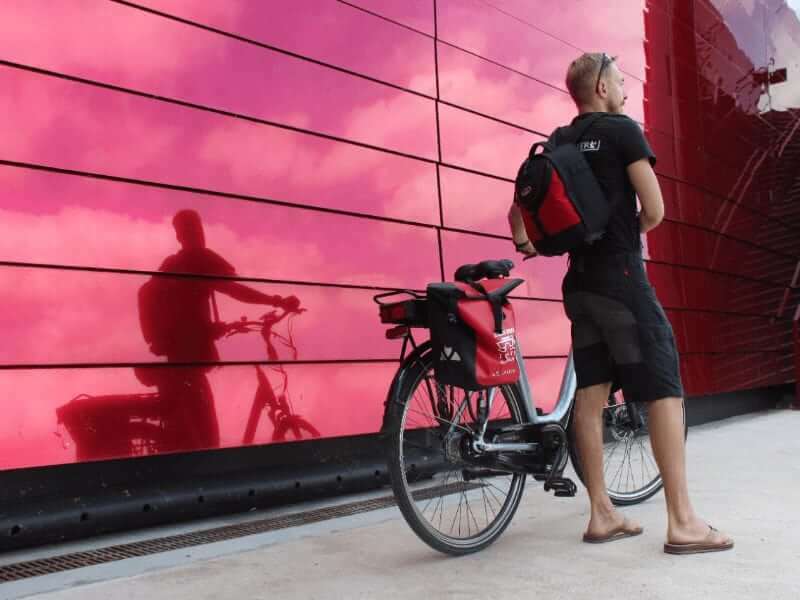 In the morning the ship cruises from Bordeaux, following the Garonne downstream to Lamarque in the Gironde estuary, to start your cycling tour in the famous Médoc wine area. Winding your way through vineyards, you will discover some of Médoc’s most beautiful castles and prestigious wineries, which pride in 21 first great classified growth, including the Châteaux Palmer, Issan, Lewis Brown, Rauzan Segla, Ferrière, and the last but not least Château Margaux. You can stop at one of these great wine estates for a visit / tasting (optional) and learn everything about classifications before returning to the boat. In the late afternoon, the ship will cross the wide Gironde estuary to the jetty of Bourg, a picturesque little town near the confluence of the Gironde and Dordogne rivers. The old city center overlooks the Gironde estuary. 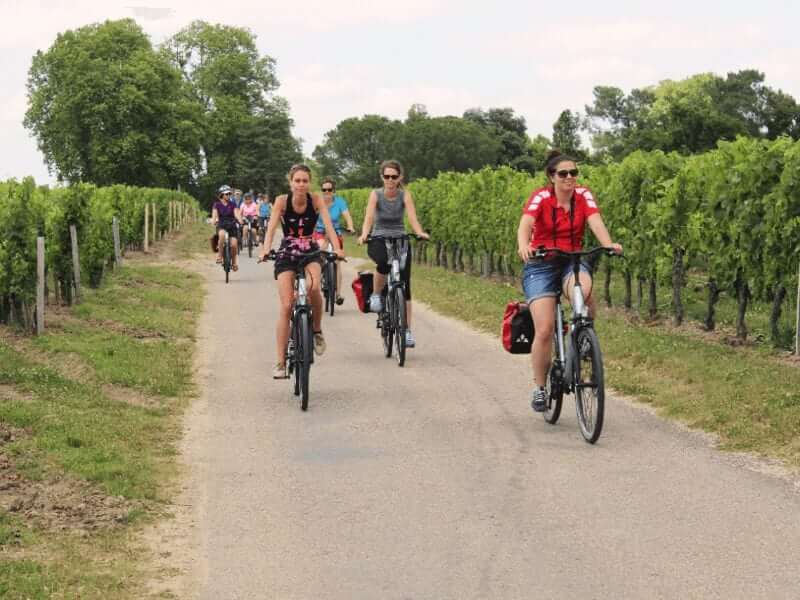 Cycling from Bourg you will enter the Côtes de Blaye vineyard. Its wine chateaux may be less well- known but their production has nothing to envy to its more famous neighbors on the more famous opposite river bank of Médoc. You will be surprised to see what this region holds in secret behind its hilly landscape covered with endless vines and dotted with scattered fairy tale chateaux and elegant manor houses. Since the Middle Ages, countless numbers of pilgrims on their way to Santiago de Compostella have passed through this region. Be enchanted by the “douceur de vivre” (sweet life), so typical for this wine region. In Blaye, take a short loop through the Vauban Fortress (on the UNESCO World Heritage List) to admire this military masterwork of the architect of Louis XIV, the “Sun King”, before you return to Bourg by cycling part of the “Corniche”, a scenic, quiet road along the Gironde estuary. In the evening you will sail to Fronsac / Libourne on the Dordogne river. In Libourne you can stroll to the picturesque city square, lined with buildings dating as far back as the 16th century. You can visit the beautiful weekly farmer’s market on Friday mornings, before starting your exploration of the famous Pomerol and Saint-Émilion wine areas. Pedaling the countryside, bristling with vines, you will enjoy riding through this unspoiled UNESCO World Heritage landscape. Cycling the landscape provides a unique view of the village’s medieval lanes and surrounding vineyards. 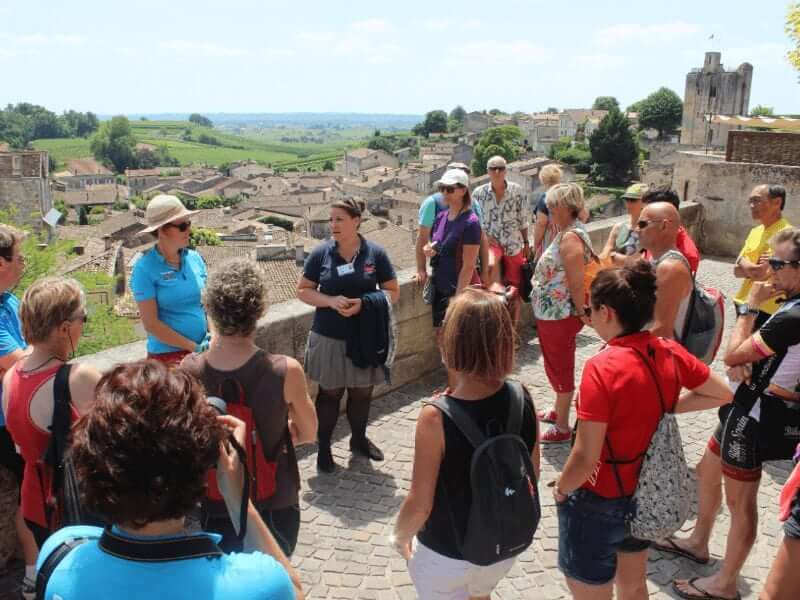 Take some time to visit beautiful Saint-Émilion. 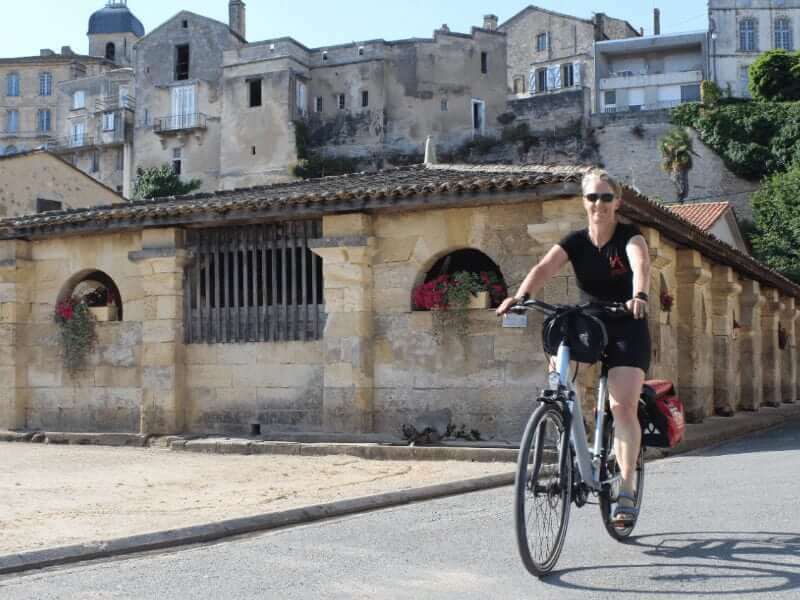 Your ride will continue on small picturesque back roads and paths where you will get a glimpse of Saint Émilion’s most famous châteaux. Along the way you will see some of the first classified wines such as Angelus, Ausonne, Cheval Blanc, Petrus – some of the world’s most famous wine estates. A true paradise for wine lovers! End of your tour: Disembarkation after breakfast until 9.30 am. Time for a return bus transfer (optional) to the pre-agreed drop off point at the Gare St. Jean train station of Bordeaux. The Garonne, Gironde and Dordogne Rivers are part of a tidal river system that results in changing water levels (daily changes of up to 6 meters / 20 ft.) in the region. Every effort is made to follow the scheduled itinerary, however, based on tides it may be amended or modified as required. Especially between Bourg and Blaye and in Entre Deux Mers, some short sections with steeper slopes are part of the cycling tour. 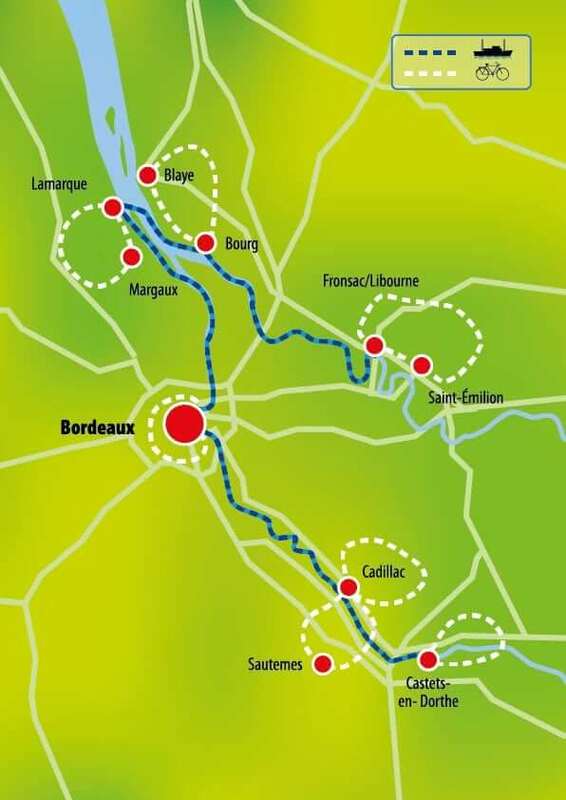 The Sauternes and Entre-Deux-Mers cycling loops can be offered both starting and ending in Castets, as well as in Cadillac; depending on the availability of moorings, a choice will be made by the captain of the ship. On the arrival day is it possible to load your luggage on board from 1pm. Boarding starts at 3pm. Wine Tasting: On the first or second night aboard the ship there will be a presentation of the different wine regions. The crew will also explain about the special ‘tasting coins’ and wine glass, which can be used to taste a maximum of six different types of wine. Tokens can be purchased from the vending machine for €2.50 each; during the wine tasting they are half price. All wines from the assortment of the ship Bordeaux come from all different wine regions. You are invited in the lounge, restaurant and on deck to drink wines you’ve bought in a winery or chateau during the cycling tour. Glasses will be supplied at the bar of the ship. To drink your own bottle of specially bought wine, you must pay a corkage fee of 5 coins (€ 12.50). The crew will mark your bottle with a sticker, so the settlement of your account will be done properly. Please note, it is not allowed to drink wine in your cabin nor is it to drink wine from the supermarket aboard the ship. Individual arrival and optional early afternoon bus transfer from the meeting point at the Gare St. Jean train station in Bordeaux to the mooring location of the ship in Libourne or nearby Fronsac on the Dordogne River. Boarding starts at 02.00 pm. After settling into your cabin, try out your cycling legs with a short first bicycle ride in the Libourne / Fronsac region. Before dinner, during the welcome speech and first briefing, a welcome cocktail awaits you on board. Your day starts with a visit and stroll to the picturesque Libourne city square lined with buildings dating as far back as the 16th century and the very picturesque (partly covered) commodity and farmer’s market. In Libourne your exploration of the famous Pomerol and Saint-Émilion wine areas starts. You will enjoy cycling through this unspoiled UNESCO World Heritage landscape on small picturesque back roads and paths. Along the way you will pass the prestigious Angelus, Ausone, Cheval Blanc and Petrus châteaux and vineyards – some of the world’s most famous wine estates – a true paradise for wine lovers! Highlight is a visit of Saint Emilion. In the evening the ship will cruise down the river to the small town of Bourg at the confluence of the Dordogne and Garonne rivers where you will berth for the night. As you cycle, you will visit village squares and towering chateaux. Be enchanted by the ‘douceur de vivre’ (sweet life), so typical for this wine region, the Côtes de Blaye vineyards. Although the wine from this region may be less well-known than some famous “neighbors” in the St. Emilion, Pomerol and Médoc areas, the quality of the wines is surprisingly high. As you cycle you will see endless vineyards, some fairy tale chateaux and elegant manor houses. Since the Middle Ages countless numbers of pilgrims on their way to Santiago de Compostella in Spain have passed through this region. In Blaye, take a short loop through the Vauban citadel (UNESCO-site) to admire the military masterwork of the architect of “Sun King” Louis XIV. Return to Bourg via the “Corniche”, a scenic, quiet road along the Gironde estuary. This morning you will enjoy breakfast while sailing the wide Gironde estuary to the jetty of Lamarque. 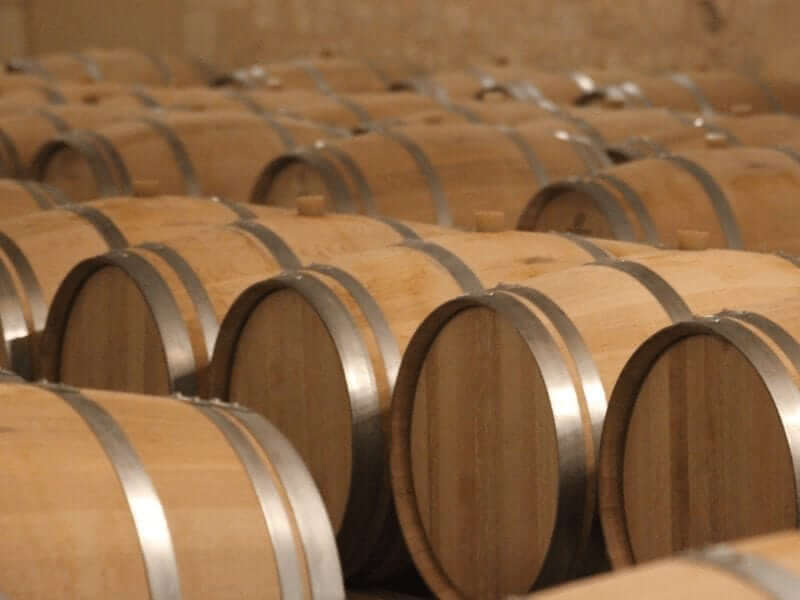 Later, as you wind your way through the vineyards, you will pass some of Médoc’s best wineries including the châteaux Palmer, Issan, Lewis Brown, Rauzan Segla, Ferrière, and last but not least, Château Margaux . You will have the opportunity to stop at one of these great wine estates for a visit / tasting (optional). In the late afternoon the Bordeaux will sail along the Garonne River towards the enchanting city of Bordeaux. The ship will berth for the night in the city center where you will see the region’s most prestigious panorama: the Stone Bridge, Place de la Bourse and Quai des Chartrons. 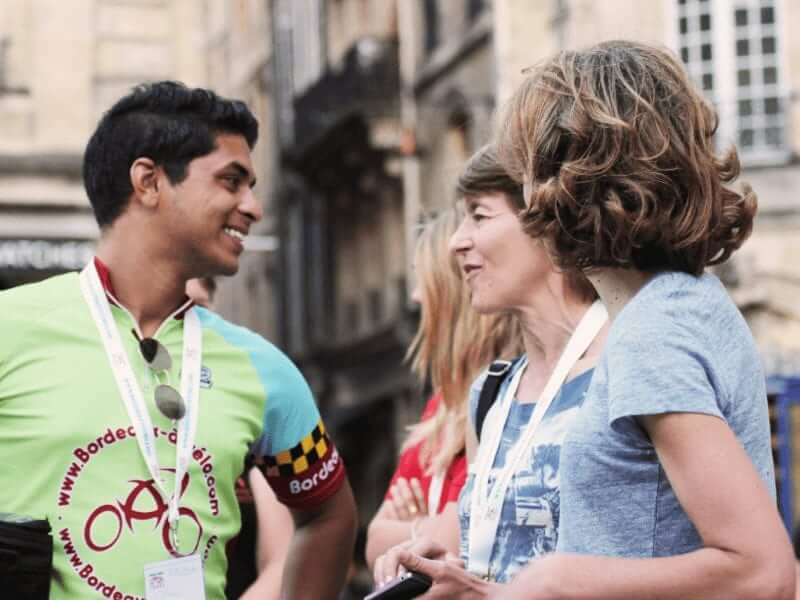 The highlight today is a visit of the city of Bordeaux where you will have the opportunity to explore the historical city the best way possible – on two wheels. Enjoy fantastic views of the old city’s waterfront during a bicycle ride on the new bicycle paths along the Garonne river. You will have an introduction with the town’s historical background, followed by the exploration of some of its main attractions, walking or by bicycle; the royal entrance of the city (Cailhau Gate), the Big Bell of Pey Berlan, the Golden Triangle, the Girondins column, the water mirror, Place de la Bourse… and more. 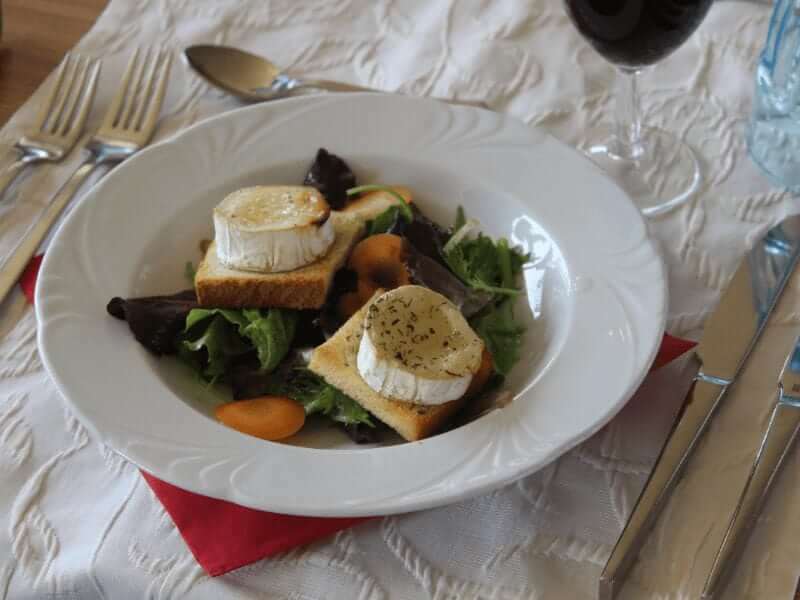 Visit historic squares, a hidden garden and quaint locations where you can stop for a tasting of Bordeaux’s renowned “cannelés” and coffee or take some fresh oysters and white wine. There is free time in the afternoon to shop or explore. Be sure to explore the town’s streets and shops where fine wines are still stored in underground cellars carved in stone or to visit the newly opened astonishing “temple of wine culture”: La Cité du Vin. After dinner you will cruise the Garonne upstream to the picturesque town of Cadillac or nearby Loupiac. Today we will discover the Sauternes region, where sweet dessert wines are made. We start by enjoying the view from Sainte-Croix du Mont before having a look at the grave of painter Henri de Toulouse-Lautrec. The route then follows the winding banks of the small Ciron river; the colder waters (from the Pyrenees) flow into the warmer waters of the Garonne. In autumn, when the weather is warm and dry, the combination of the two different temperatures produce the mist that descends on the vineyards, promoting the perfect conditions for the famous Sauternes wine. You will pass the famous vineyards of Château d’Yquem, Château Guiraud, Clos Haut Peyraguey, and many more. Wine tastings are offered here! Cadillac is located in the region of Graves, also known as the birthplace of Bordeaux wines. It is a fortified medieval village known as the Bastide in the Entre-Deux- Mers wine region in between the Garonne and Dordogne rivers. In the evening cruise further upstream to the scenic village of Castets-en-Dorthe, the end of the navigable part of the Garonne River. The first town you will discover by bicycle is the lovely Saint Macaire and its wonderful gate and walls. There is opportunity to visit the former residence of the writer Francois Mauriac as well as having a wine tasting at a château. Riding along corn and sunflower fields you reach La Réole, using an Eiffel style bridge over the river Garonne. This town is famous because in 1190 Richard Lionheart, on his way to the holy Land, gave the town hall building to thank the locals for their loyalty to the English crown. This historical place holds two castles, an impressive church as well as narrow cobblestoned streets. To end the day you will enjoy the bicycle path along the “Canal de la Garonne” and its deep blue water, built in Napoleon times. You can either go directly back to the ship or ride to Meilhan-sur-Garonne and the amazing scenery it has to offer. 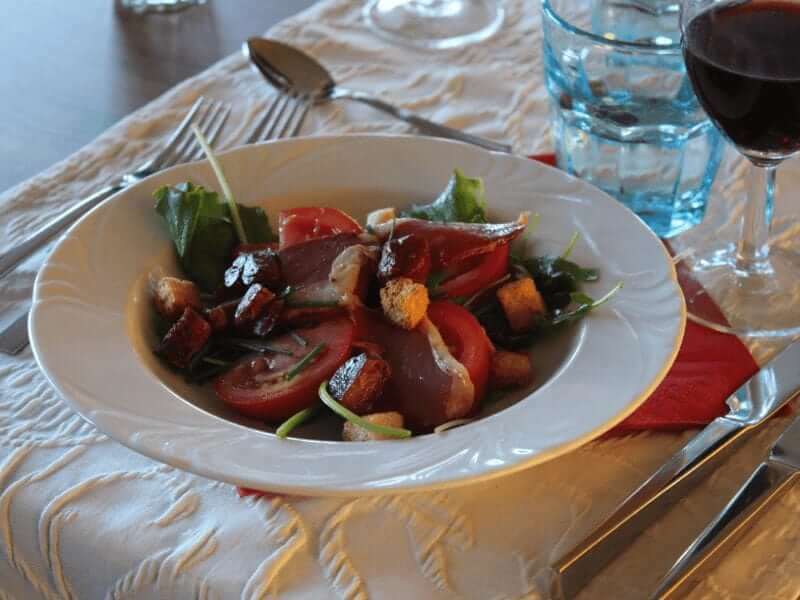 Your last dinner on board is in Castets-en-Dorthe. Castets-en Dorthe – Libourne, departures on March 30; April 13 and 27; May 11 and 25; June 8 and 22; July 6 and 20; August 3, 17 and 31; September 14 and 28; October 12 and 26. Libourne – Castets-en-Dorthe, departures on April 6 and 20; May 4 and 18; June 1, 15 and 29; July 13 and 27; August 10 and 24; September 7 and 21; October 5 and 19; November 2. Saturday at 2:00 pm. from meeting point Gare St. Jean TGV-train station in the center of Bordeaux to the ship (Castets-en-Dorthe or Libourne/Fronsac, respectively) and return on next Saturday at 9:00 am. from the ship to the train station in Bordeaux (transfer time: 1 hr. each). Roundtrip € 50 p.p. Only available when booked in advance. 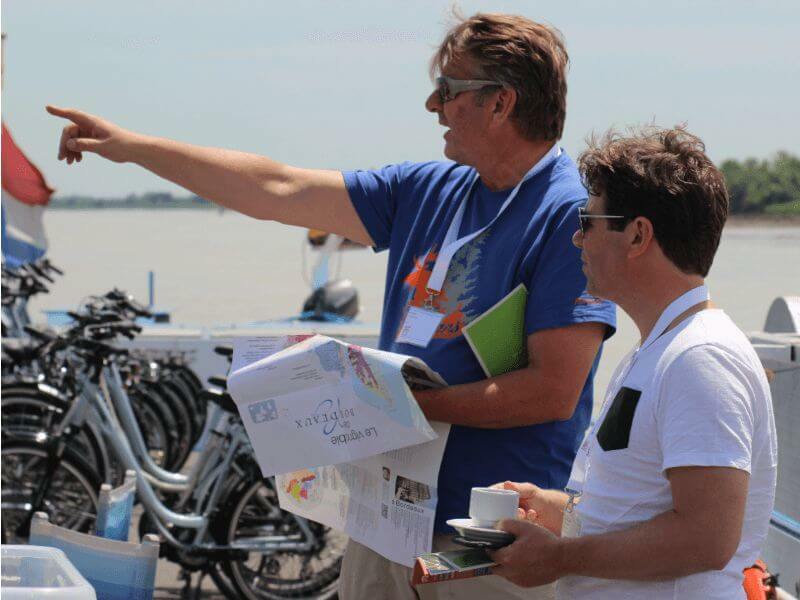 During the daily cycling tours you will cycle with an English/French speaking tour leader in a small group, max. 15 persons. The surcharge for this “fully guided” option is € 150 p.p. On board, GPS-devices with all GPS-tracks for recommended cycling tours are available (free of charge / deposit € 100). A limited amount of helmets is available onboard free of charge. The Bordeaux can accommodate a maximum of 80 guests in one of the 34 twin cabins or 2 junior suites on the lower deck, or in one of the 11 twins or 2 singles on the upper deck. Take a seat in the tastefully furnished salon in the front of the ship and order a drink at the bar. Your three course dinner will be served in the separate restaurant area with large panoramic windows all around. During the evening you can burn some extra calories on the small dance floor. On the sun deck is a large sunroof, chairs and tables, and a cycle shed on the aft deck. Our rental bikes are modern unisex touring bikes with normal mount, 21 gears, SRAM grip shifters and two handbrakes. There are 2 different frame sizes. The bicycles have aluminum frames with frame suspension and front suspension for unbeatable comfort. All bicycles have a unisex gel saddle, some bicycles also have saddle suspension. The E-bikes have an 8-speed Shimano hub gear, SRAM grip shifter and 2 hand brakes and aluminum frames with frame suspension and front suspension for unbeatable comfort. The crank engine offers 3 to 5 levels of support. All E-bikes have an unisex gel saddle and saddle suspension.